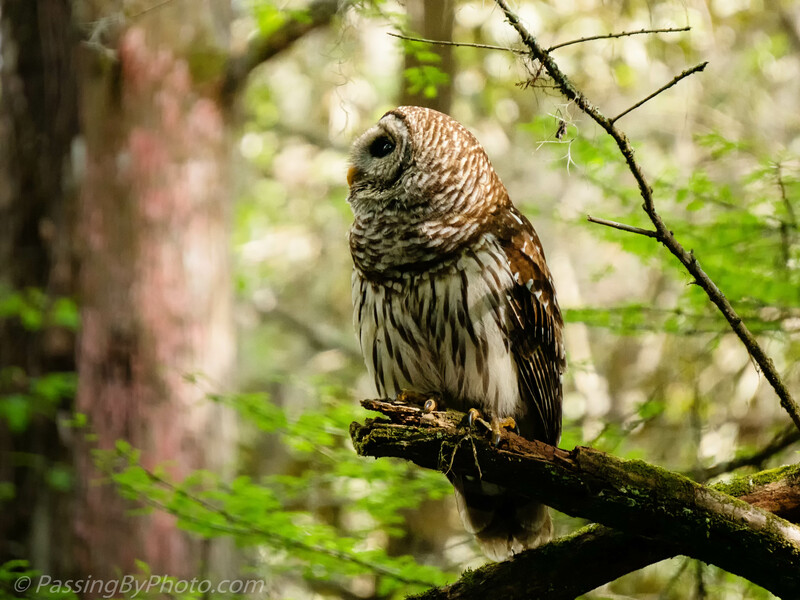 I heard two Barred Owls talking to each other with that low cooing sound they use when they are on the hunt. 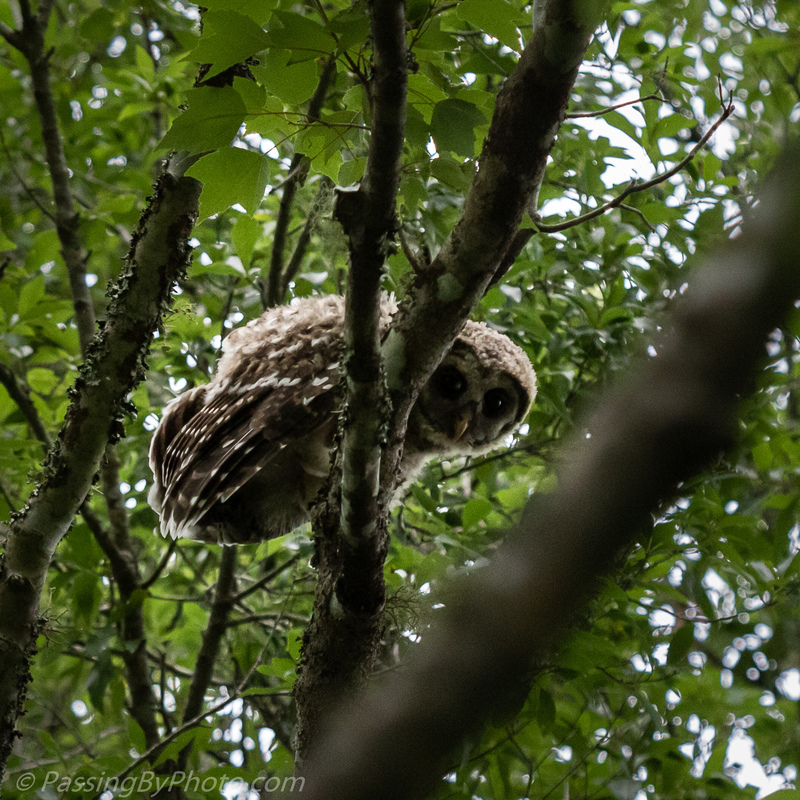 After perching in a few spots in the tree canopy one of them settled for a bit above a small pond. 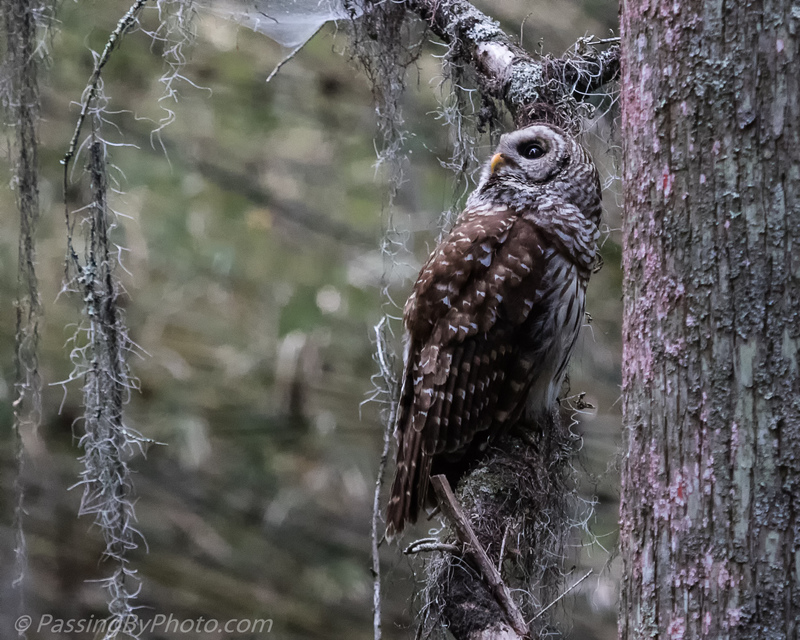 I check this spot regularly, knowing that at least a pair of Barred Owls hunt here. Looking through past posts, June of 2018 was the last time my passing here was rewarded. 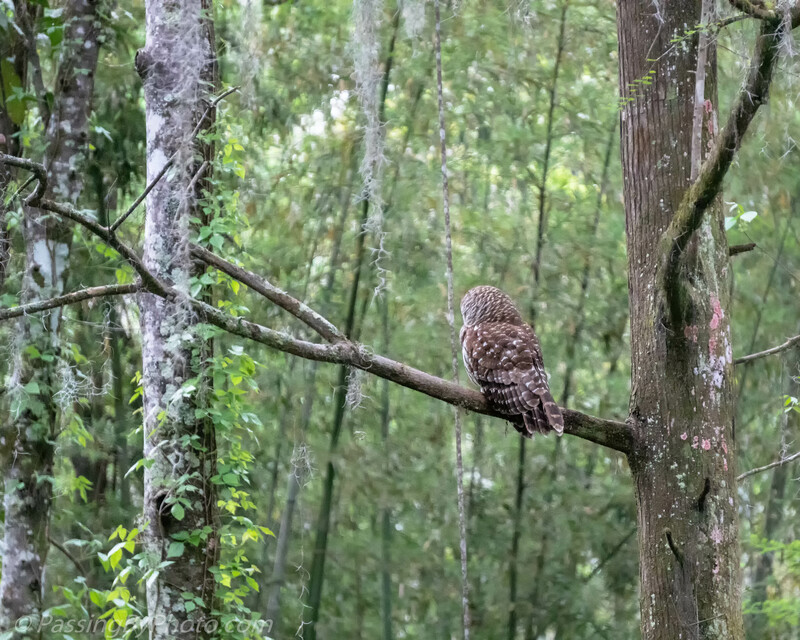 A pair of Barred Owls frequents the pond near this stand of bamboo looking for food. 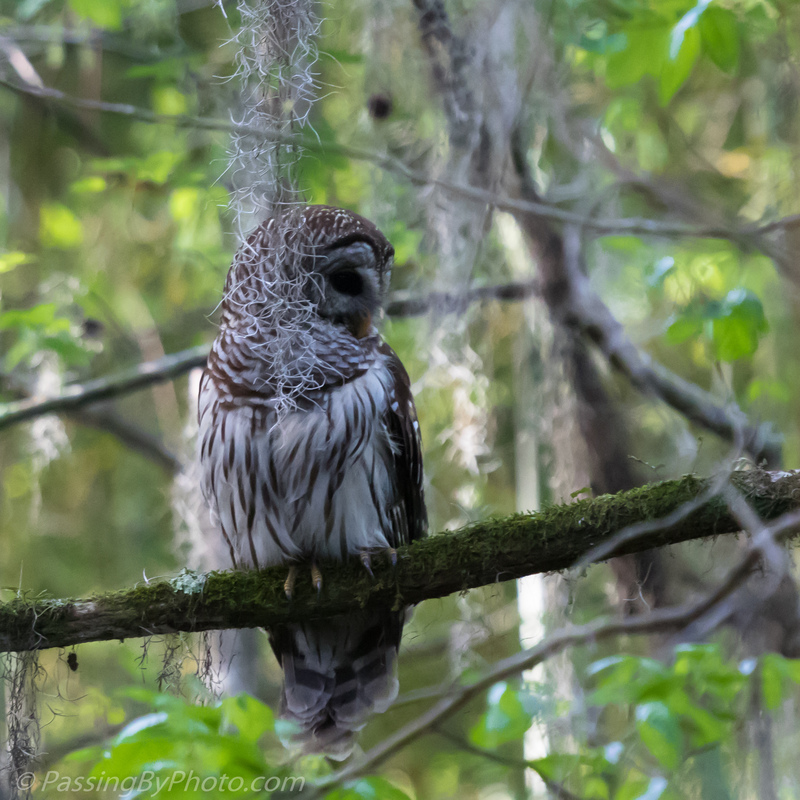 This owl had just had an unsuccessful attempt to catch a noisy bullfrog. 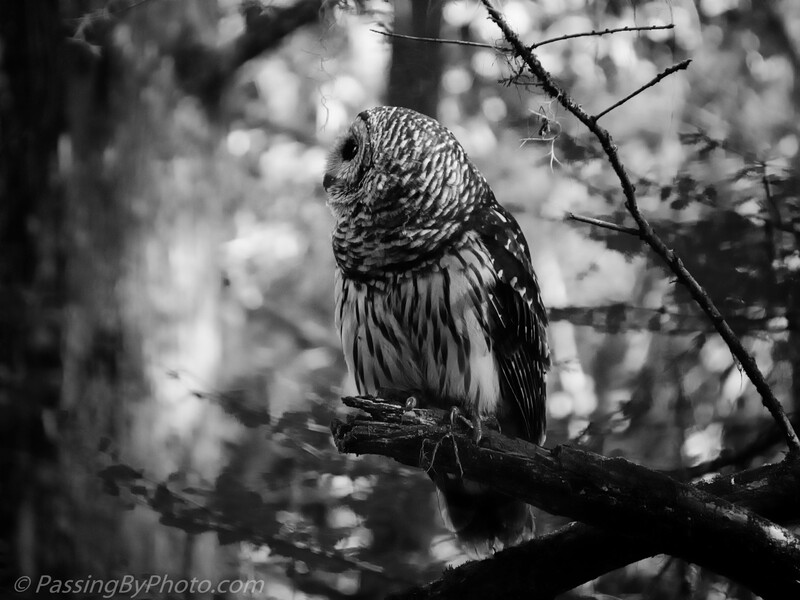 The bullfrog stopped his song but the owl flew away with nothing in his talons. 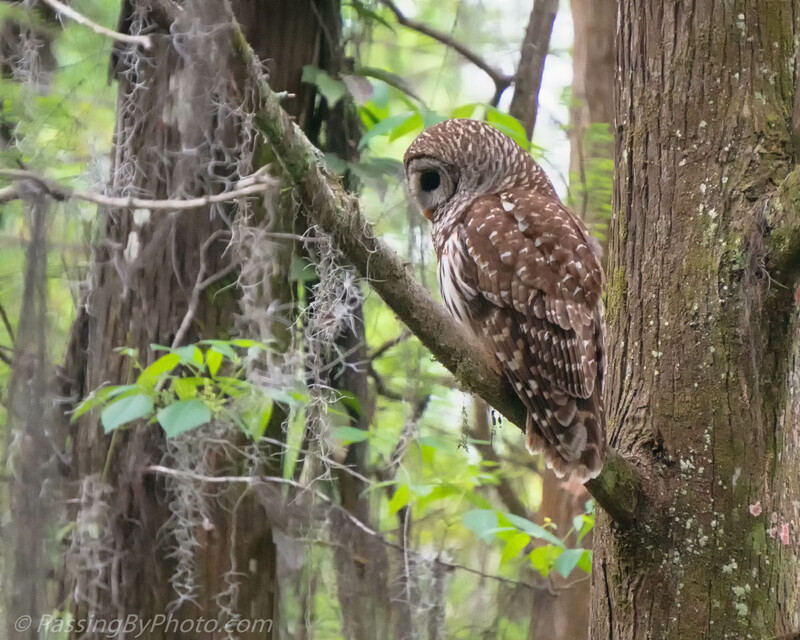 The owl chose a spot with a good view of the pond to watch and listen for his next opportunity. 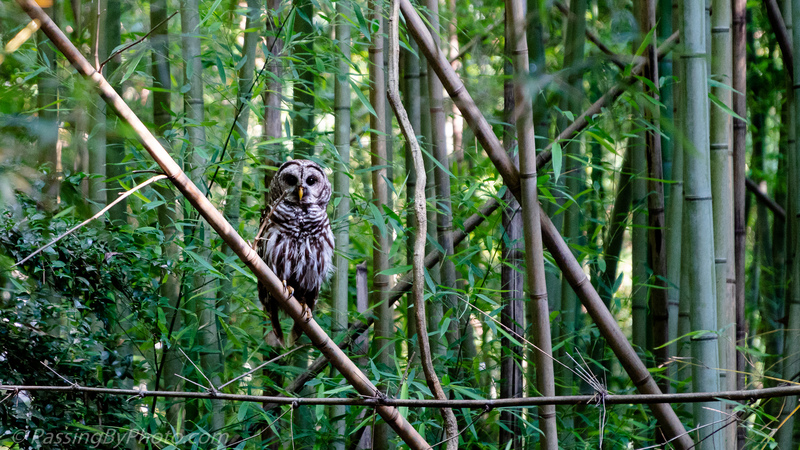 Native bamboo was grown on the plantations in South Carolina to create natural barriers to help keep livestock in and keep predators out. Today it makes a beautiful addition to some of the area gardens and museum properties. 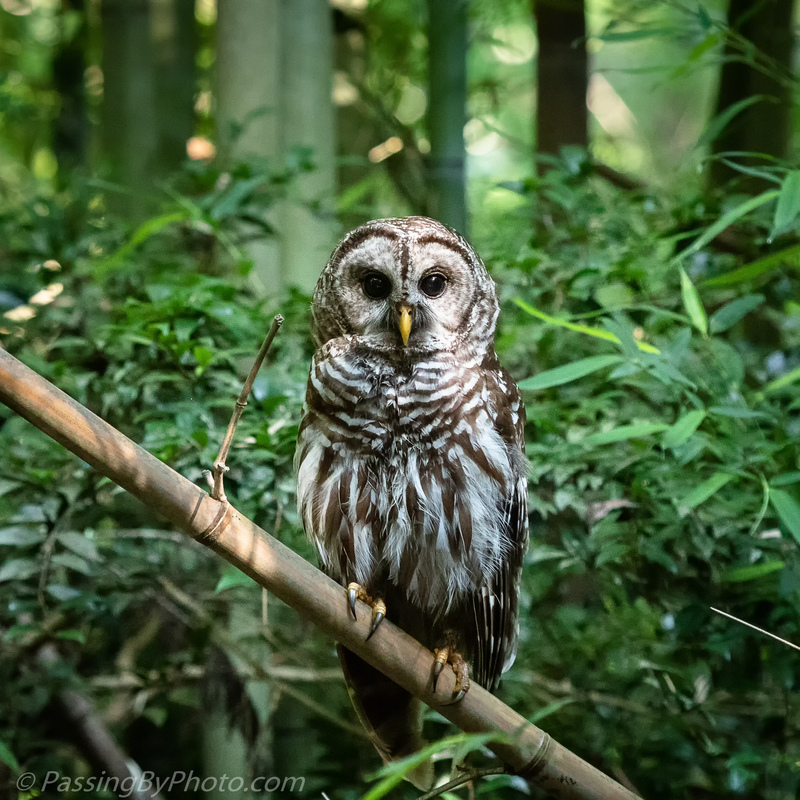 We visited Beidler Forest last week with out of town guests. 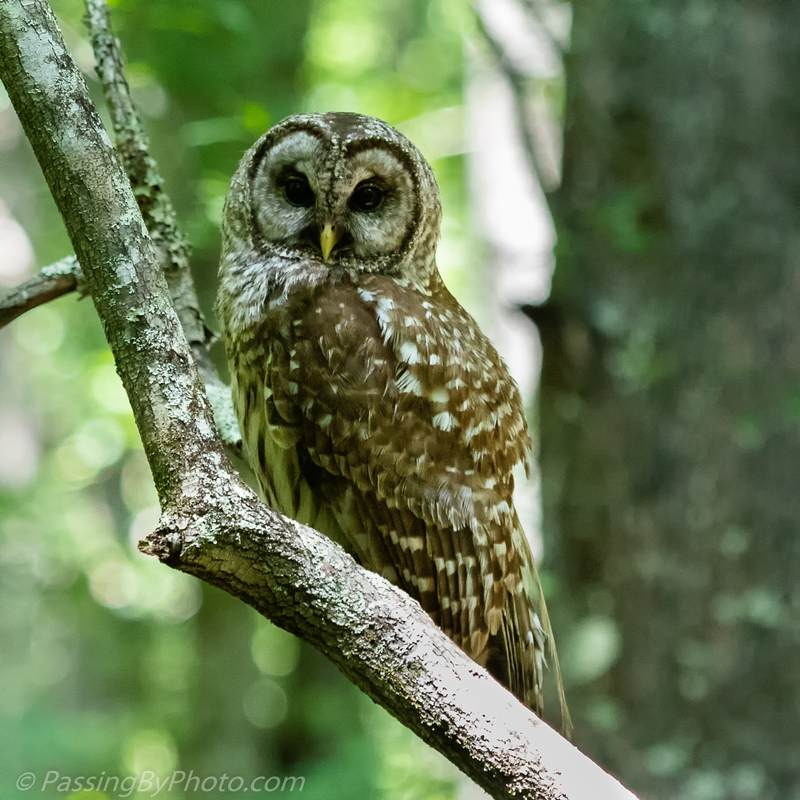 We were all delighted to see a Barred Owl shortly after leaving the visitor center and quite close to the board walk. 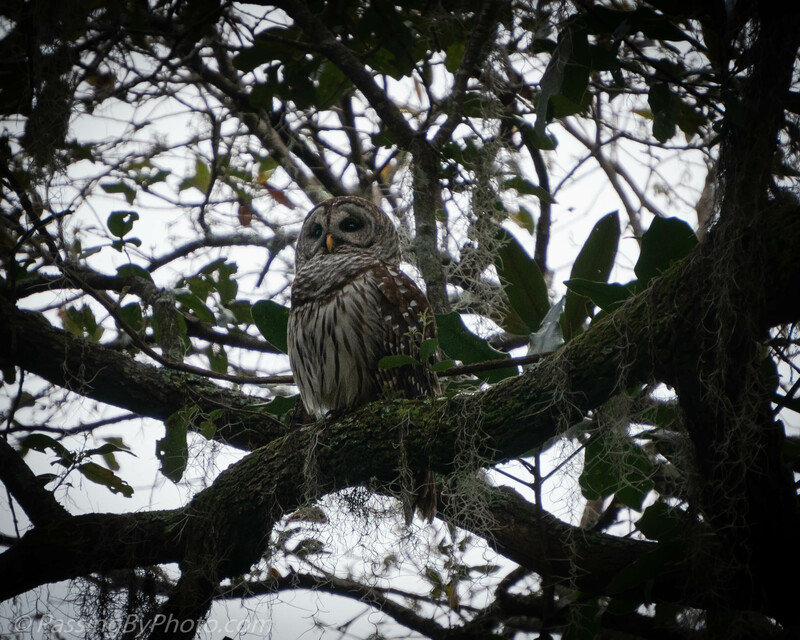 The owl impressed the guests with a head swiveling demo but opted not to go fishing while we were watching. 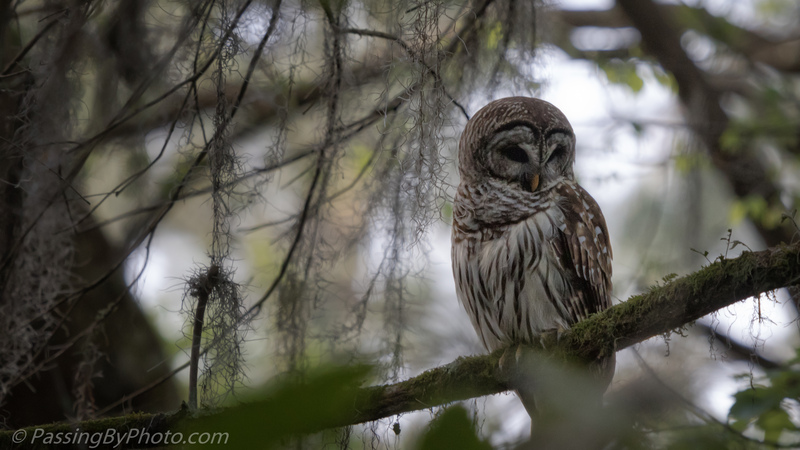 It had clouded over on our way to visit the owl spot meaning the light was low, but we continued on. 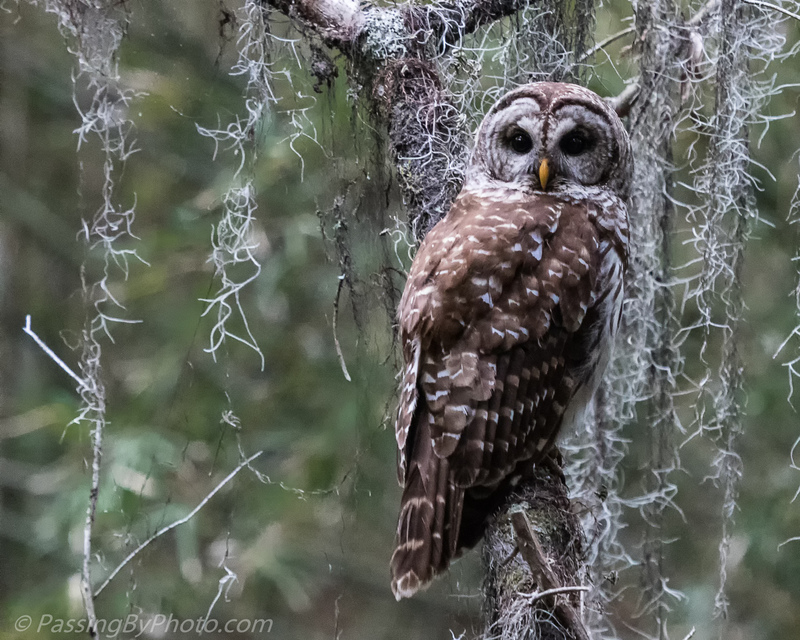 It was for owls, after all. 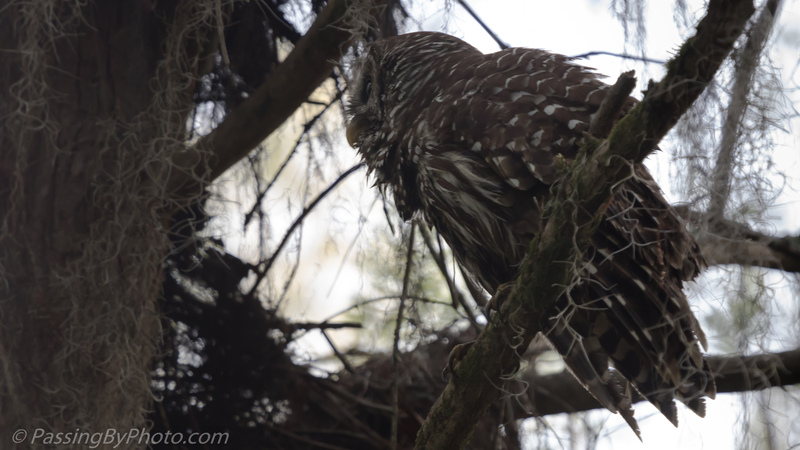 He was there, looking around and fully aware we were watching him. 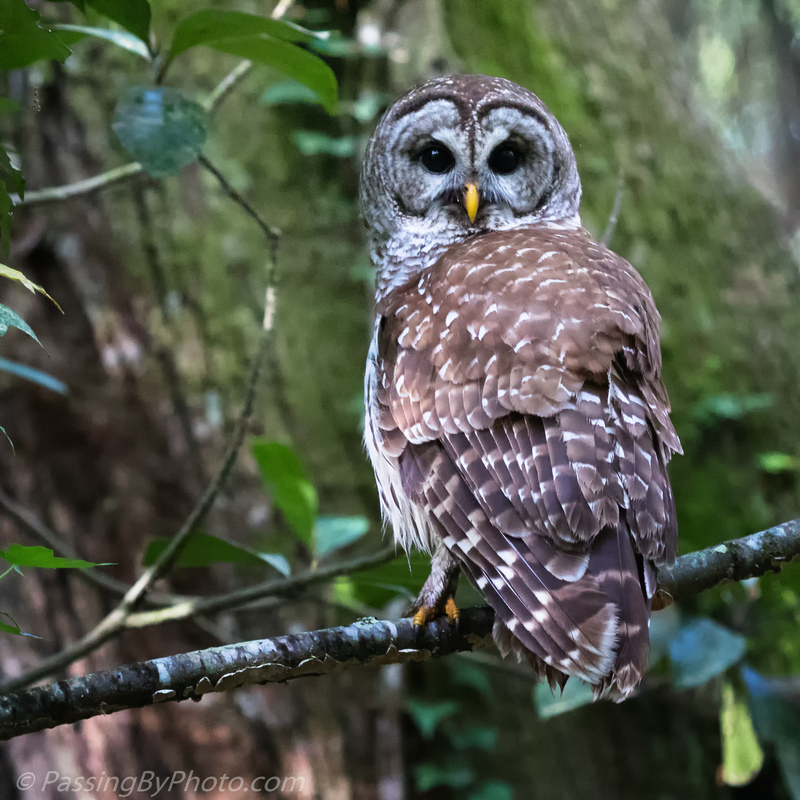 The best time to photograph these Barred Owls is first thing in the morning. They hang around the pond looking for food and bathing. The tree canopy is filling in and the morning we were there it was mostly cloudy, so the resulting images aren’t as clear as I’d like. 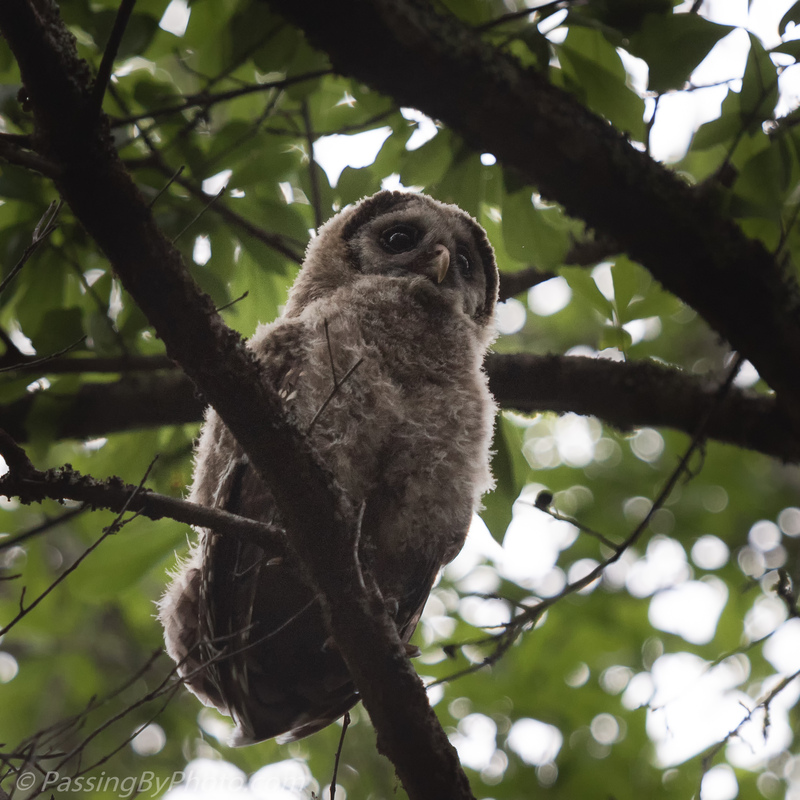 But they are Owls! The image below was taken after the frog snack of my previous post. We were moving on and the pair flew over us headed back to the pond. 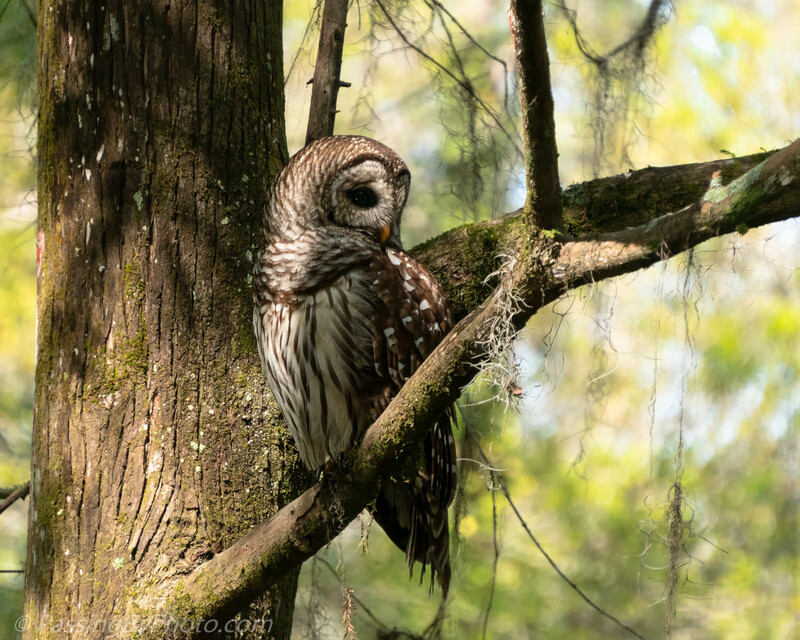 The first Barred Owl from my previous post appeared to be just hanging out on a limb above a small pond, maybe nodding off. All the while he was watching the water below. He dropped down and out of my sight. 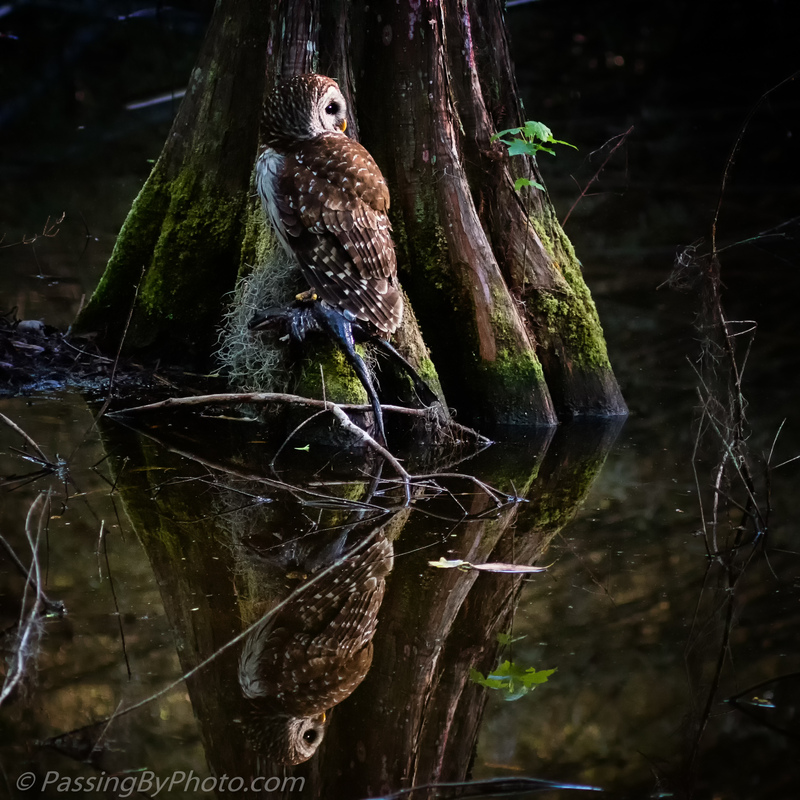 I circled around the pond to discover the Owl posing nicely at the base of a Cypress tree. I didn’t see the frog until I was developing the images. 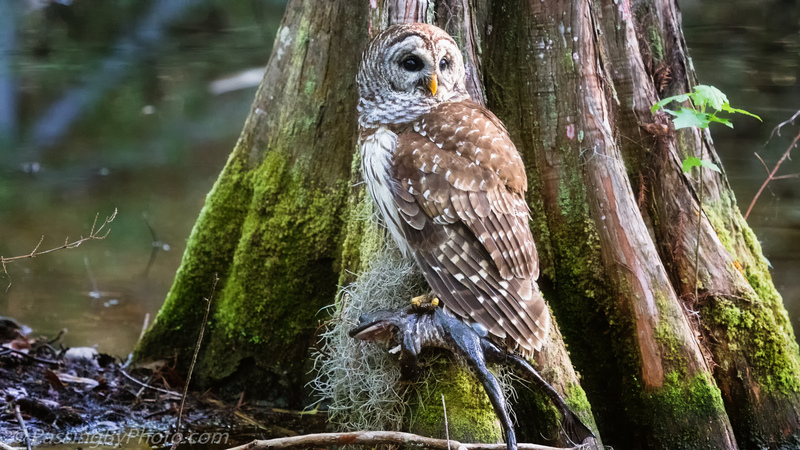 The presence of the frog explained the behavior of the mate, who had moved to a branch above, hunched over watching, and was making clucking noises. After a few minutes of this they flew off together, I hope to share the frog.